Bushnell 732632 Trophy 2-6x32 Multi-X Reticle Riflescope 732632 FREE SHIPPING! The Bushnell Trophy 2-6x32 is a high-performance hunting riflescope. Its premium multi-coated optics enhance light transmission to produce a clear, bright image, and the advanced Amber-Bright coatings increase contrast, making it easier to pick out camouflaged targets. The rugged one-piece tube resists impacts and shocks and its O-ring seals and nitrogen fill prevent water intrusion and fogging, maintaining high performance in all weather conditions. Its fingertip-adjustable, resettable windage and elevation adjustment allows you to accurately compensate for distance and crosswinds, allowing you to land the perfect shot with ease. 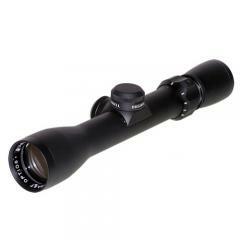 ©2002-2019 CopsPlus.com: Bushnell 732632 Trophy 2-6x32 Multi-X Reticle Riflescope 732632 FREE SHIPPING!